Hi friends! I hope you are doing well! We are great around here! Spring is in the air and we are getting our allergies under control. ;) A little NorCal humor for you. This show is REALLY important to me. Why? Because growing up in the US in the 90's as an Asian kid was hard. There was NO ONE on TV that looked like me. There was ONE Asian Barbie doll. No Asian singers in US music. Since there was a lack of Asians represented on TV and in music, no one really understood me and my culture. Things that people don't understand often make them uncomfortable. People who look different than everyone else you're used to seeing often get treated differently. From being called racist names to people pretending to "speak Chinese" to all the nail shop jokes, I've heard it all. You get used to it and that's just sad. I, like Eddie, had to go to middle school in a town with predominately white people. It's hard when you don't have anyone to identify with. 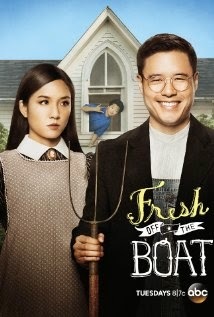 If you are Asian, have Asian friends, or ever wanted to know what like was like for an Asian family transitioning to the US, you should watch this show. ESPECIALLY if you are in a mixed race relationship! Oh my gosh, it's so nice for me to point at the TV and tell hubby "this is what it was like when I was growing up." This is the first show in over 20 years that has an Asian family as the focal point and that truly embraces what being Asian American is all about. You should check it out. I've been watching it and have enjoyed it! There are moments that I definitely laughed at knowing that's how it was with me (e.g., the part about Asian families not explicitly saying "I love you," because it's understood, which is definitely in contrast to how my husband's family is). I am half asian and there are times I want to be offended but then have to admit....yup that's how it really is. Bahahaha. Right?? Like the episode with the air conditioning?? I was not going to watch because I read the book and I pretty much don't like the guy, but I did watch the first episode On Demand today and not bad. I'll give it another shot.